Onetime (and long-time) chef at San Francisco foodie mecca Chez Panisse, New York Times City Kitchen columnist, and author of one of the most beloved (and a personal favorite of this writer) cookbooks ever, A Platter of Figs, any recipes that David Tanis doles out I eagerly scoop up. Onetime (and long-time) chef at San Francisco foodie mecca Chez Panisse, New York Times City Kitchen columnist, and author of one of the most beloved (and a personal favorite of this writer) cookbooks ever, A Platter of Figs, any recipes that David Tanis doles out I eagerly scoop up. 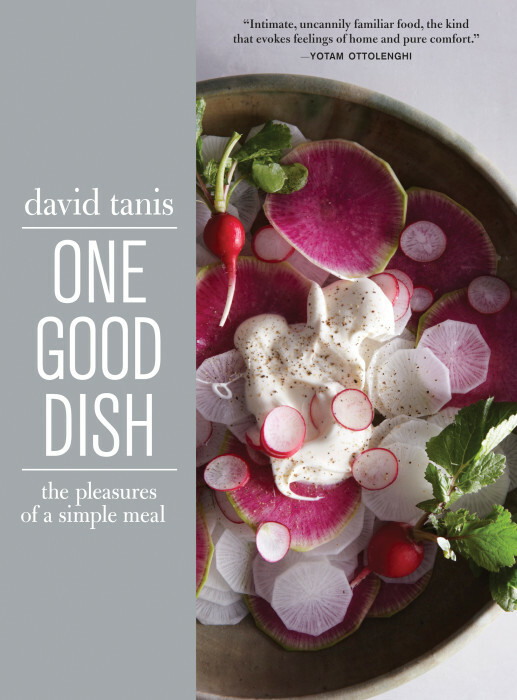 And in his latest effort, One Good Dish (Artisan Books), Tanis offers a plethora of delicious, satisfying and, perhaps most importantly, simple, dishes designed with the home cook in mind. Executing elaborate multi-course meals on a nightly basis is but a dream for most of us; same goes for Tanis. And this book is inspired by his regular kitchen m.o. : cook one good dish, serve with a green salad. The book’s ingredient lists are tidy, instructions, decidedly unfussy, and all the recipes are divided, rather adorably I think at least, into mode of preparation or consumption: for example, Eating with a Spoon includes all things soupy or easily shoveled into the mouth, and Strike While the Iron is Hot collects all that is seared and griddled. And the lushly beautiful images (courtesy of the genius photographic tag team, and regular Gather contributors, Gentl & Hyers) make the recipes that much more enticing. Thus far, his swiss chard al forno, Egyptian breakfast beans, and mackerel rillettes have all made it to my table (each served alongside nothing but a green salad, as Tanis suggests) and many more pages have been dog-eared in anticipation. The title of the book may be One Good Dish, but I would contend that there are in fact many excellent ones to be found inside. FIORELLA V.